Sydney Shop Girl: I Am 'That' Friend. Meatballs. I Am 'That' Friend. Meatballs. It's not that I like to blow my own trumpet or anything, but I reckon your friendship circle needs someone like me in it. Especially when it comes to taking your collective relationship to the next level with a group chat. I'm showing my age just acknowledging that group chats are an integral part of friendships in 2018 but anyway. I'm that girl who keeps it real with the 'meanwhile...' this is what I'm doing while we're having this exciting gossip photos. 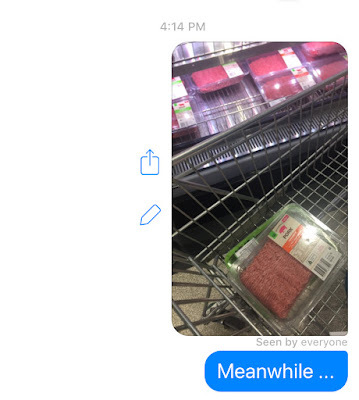 How can you not feel chirpy about your own life when elsewhere in the world someone like me is struggling with a rebellious shopping trolley and asking how it came to be that a kilo of various minced meet at the supermarket costs around $15 these days. Life. It's 10% what happens to you and 90% your reaction to it. To paraphrase an eloquent person who probably wasn't describing an experience in the Woolies meat department. More about the mince later in the post. As we head into autumn, I've had a sudden urge to wear all my whites and brights before it gets too cool and dark for them. This silk scarf is a souvenir from LA. It's a print of Yayoi Kasuma's 'Infinity Mirror Room - the Souls of a Million Light Years Away'. Here's a photo from Google depicting the original work. Have I convinced you to visit The Broad when you're next in LA? The scarf is exclusive to their store. I went all the way to Costco to buy this instant cauliflower rice (it's like those packets of evil actual rice - you just zap the opened bag in the microwave before eating). Instagram tells me you can also find it at Woolies. My mind tells me that since I'm having it as 'the carbs' for dinner I can eat it with Chinese style pork belly plus have a chocolate croissant for dinner afterward. Your method may vary. The cauli rice itself was surpisingly filling and worked well as a jasmine rice substitute for my Chinese dinner. What do you eat with cauli rice? Another great tip of Nagi's is to spoon out all your meatball mix onto prepared baking trays before returning to roll at the end. Definitely, a less messy way to go about it. Baking trays? Another great point about this recipe is that you can bake the meatballs. They have so much moisture in them they won't dry out in the oven. These meatballs are seriously tasty on their own and I'm trialling them in Master SSG's lunchboxes this week as is. I might make the sauce next time when I make them for dinner. Nagi also has a recipe for chicken teriyaki meatballs that are pan-fried. They're next on my list on account of the made from scratch teriyaki sauce recipe that Nagi has kindly shared on behalf of her mum. Did you know you can test drive cars at Westfields these days? In less confronting news from the shops, KMart have this 'wood look' desk organizers on sale at the moment. They are $8 and come in two different styles. The material feels like a kind of chipboard and it's pretty sturdy once assembled. Our dining table desk is slowly becoming more organized... I really do need three different kinds of sticky tape on the go at any given moment. Happy Friday and may the weekend ahead be a good one! I giggled at the 'meanwhile' group text pic. It's true though, I'm still at a point where a lot of my friends are single and kid free and I'm just over here exhausted and ready to go to bed at 7pm on a Friday night, haha! Wouldn't change it for the world though. I was trying to focus on getting more wear from my summer pieces before the cold sets in, but they are predicting a heatwave for next week so I don't have to hurry quite so much. And I probably shouldn't have bought some knitwear...haha. I am eating Keto, high fat, moderate carbs, low carbs, and Frozen pre riced cauliflower is my new bestie. My favorite is to take 2 frozen packaged, cook in micro according to instructions, drain water from it, mix in sour cream, shredded cheddar, salt, pepper, chives, put this mixture in a casserole dish, put more cheese and some chopped pre cooked bacon and cook in mod hot oven about 25 min. Yum. It's amazing how many ways you can use it and it doesn't seem like cauliflower. I've made faux stir fry rice with it, also added it to cooked hamberger and sautéed onions with alittle tomato sauce. I could go on and on. I've been Keto since August 2017, I've lost 45 lbs. The meatballs look really good! I wish we still had a KMart here in Savannah, GA (US). A lot of them closed for financial reasons. I loved going there to get reasonably priced school uniforms for my daughter and I have used their layaway for her Christmas presents. I think they still do a lot of their business online though. The meatballs look delicious! There's no way I would test-drive a car at Westfield either it'sway too busy. I love all the homewares bargains at KMart and could spend all day shopping in there. Love the wooden look organiser! Life This Week 26/2/2018: Taking Stock. David Mallett Haircare. Possible Parallels. Lovin' Life 22/2/2018: Alphabetical Sydney. Lovin' Life 15/2/2018: Surprise Staycation. Life This Week 12/2/2018: Who's A Worrier? Lovin' Life 8/2/2018: Things and Films. LA Story #8: The Broad. Lovin' Life 1/2/2018: On My Toes.